Noctilio albiventris minor, the lesser bulldog bat, is native to Central and South America. It is the smaller of the two species in the family Noctilionidae. It is insectivorous, but may sometimes eat small minnows that it captures with its feet from the surface of small ponds and streams (the larger species of the genus, Noctilio leporinus, routinely eats fish). Minnows are detected using echolocation to scan the water surface for small disturbances caused by schooling or feeding fish. This specimen was collected from Sta. Rosa, Guatemala by R. W. Dickerman. 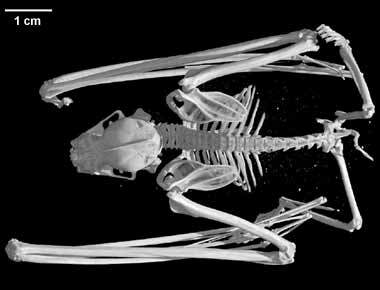 It was made available to The University of Texas High-Resolution X-ray CT Facility for scanning by Dr. Nancy Simmons of the American Museum of Natural History. Funding for scanning was provided by a National Science Foundation grant (DEB-9873663) to Dr. Simmons, and funding for scanning and image processing was provided by a National Science Foundation Digital Libraries Initiative grant to Dr. Timothy Rowe of The University of Texas at Austin. This specimen was scanned by Matthew Colbert on 15 January 2003 along the coronal axis for a total of 1295 slices. Each slice is 0.06 mm thick, with an interslice spacing of 0.06 mm and a field of reconstruction of 55.0 mm. Every other slice was deleted from the coronal movie. To cite this page: Dr. Nancy Simmons, 2003, "Noctilio albiventris" (On-line), Digital Morphology. Accessed April 19, 2019 at http://digimorph.org/specimens/Noctilio_albiventris/whole/.